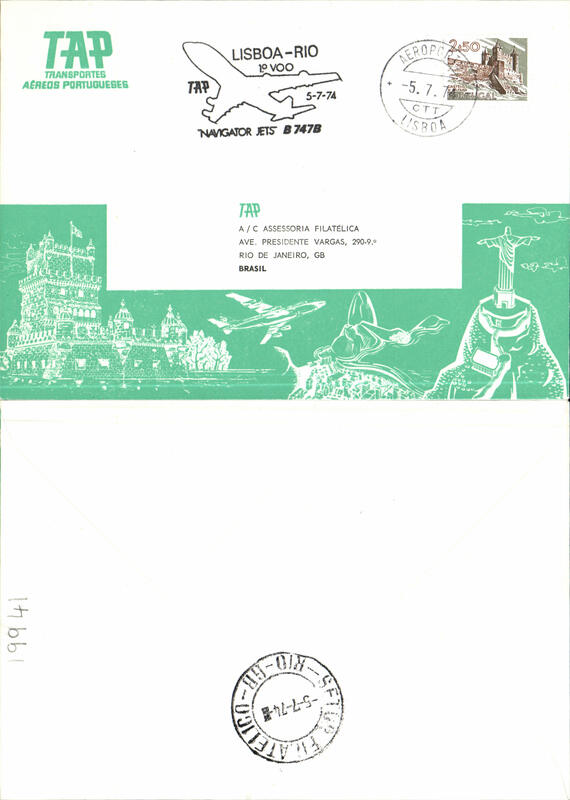 Crilly Airways F/F Lisbon to London, no arrival ds, official illustrated souvenir cover showing map of route and Air Liner "Lisboa". Crilly Airways F/F Lisbon to London, no arrival ds, official illustrated souvenir cover, showing map of route and Air Liner "Lisboa", 22x10cm . Ironed vertical fold. 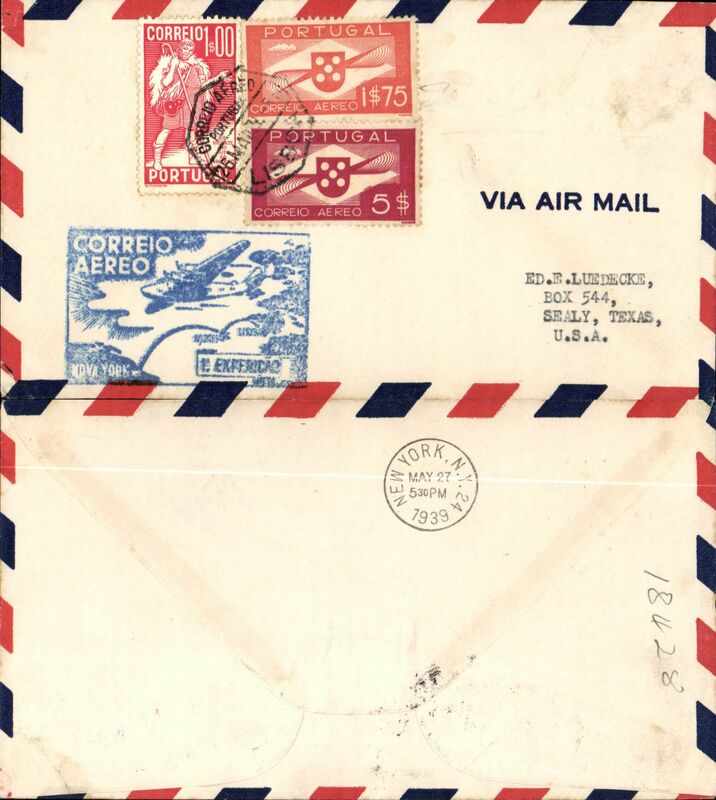 Crilly Airways F/F Lisbon to London, no arrival ds, official illustrated souvenir cover showing map of route and Air Liner "Lisboa". Image. 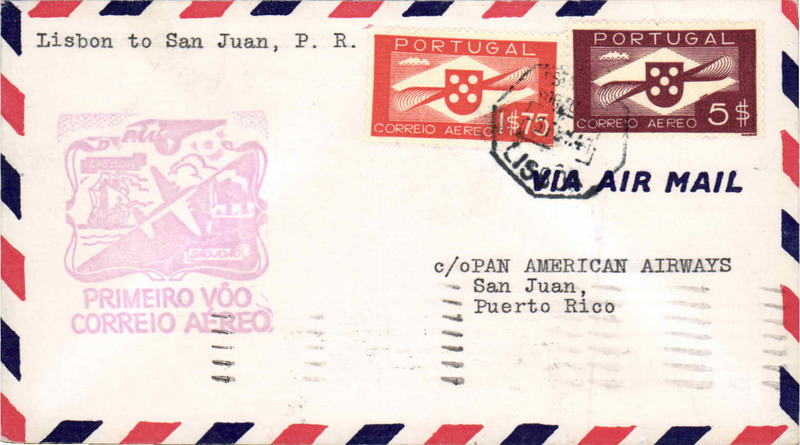 F/F FAM 18 Southern North Atlantic route, Lisbon to Marseille, bs 22/5, attractive and uncommon grey/pale grey souvenir cover franked $1.75 x2, blue flight cachets verso, Pan Am. 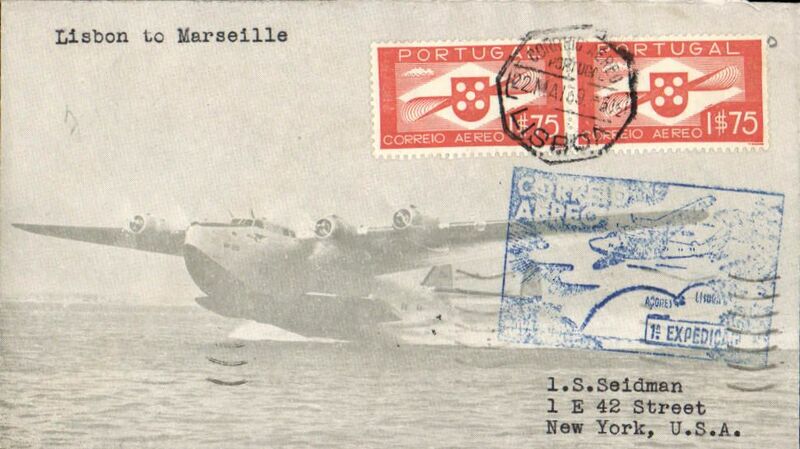 F/F FAM 18 Southern North Atlantic route, Lisbon-New York, b/s, blue cachet, airmail cover. Scarcer Crosby cacheted Pan Am Yankee Clipper Trans-Atlantic F/F via Southern route, Lisbon to Marseilles, bs 22/5, fine silver Crosby cachet, official blue Horta-Marseilles flight cachet verso, airmail cover. Popular with collectors, but not easy to find. 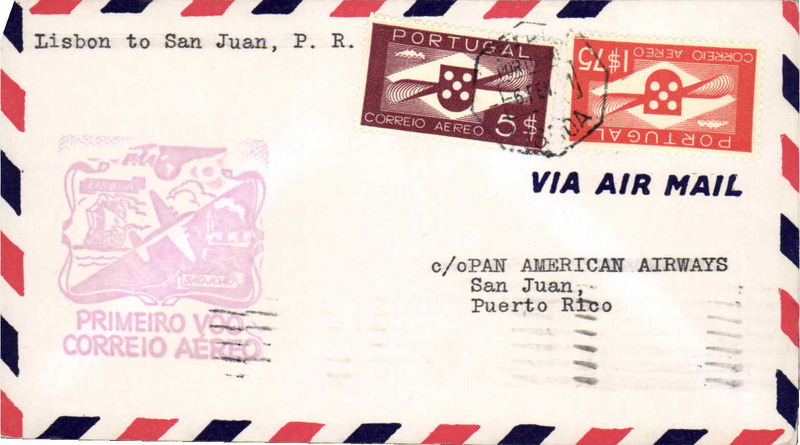 Scarcer Crosby cacheted Pan Am Yankee Clipper Trans-Atlantic F/F via Southern route, Lisbon to Horta, bs 26/5, fine green Crosby cachet, official blue Lisbon flight cachet, airmail cover. Popular with collectors, but not easy to find. 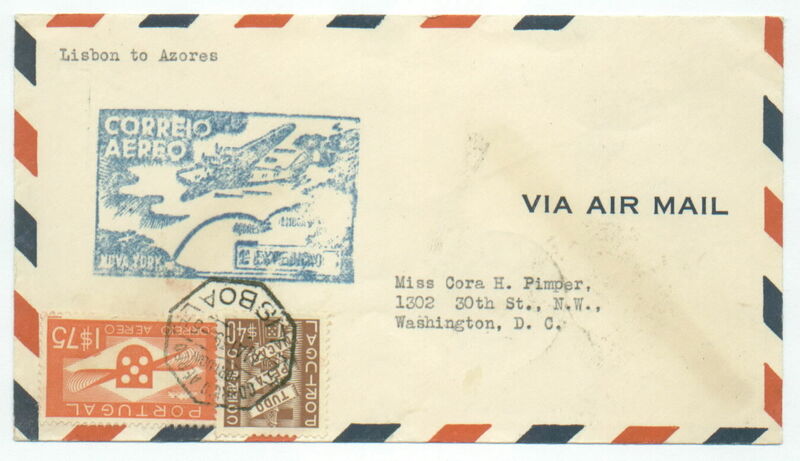 Scarcer Crosby cacheted Pan Am Yankee Clipper Trans-Atlantic F/F via Southern route, Lisbon to New York, bs 27/5, fine brown Crosby cachet, official blue Lisbon flight cachet, airmail cover. Popular with collectors, but not easy to find. 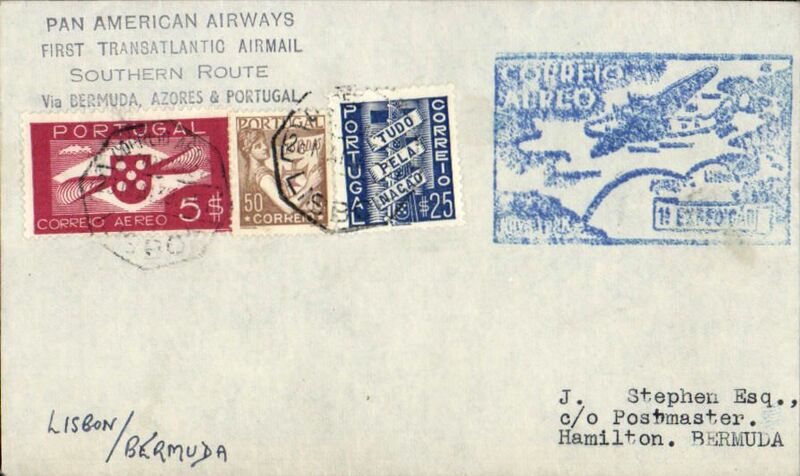 Rare acceptance of mail from Portugal for Bermuda for carriage over the Pan Am Southern Route, airmail etiquette, Lisbon to Hamilton, bs 31 May 35, via New York, May 27, airmail etiquette cover franked 5E75, canc Lisbon 26 May 39, square blue FAM 18 type F18c cachet, black four line "Pan American Airways/First Transatlantic Airmail/Southern Route/via Bermuda, Azores and Portugal", ms 'Lisbon/Bermuda'. 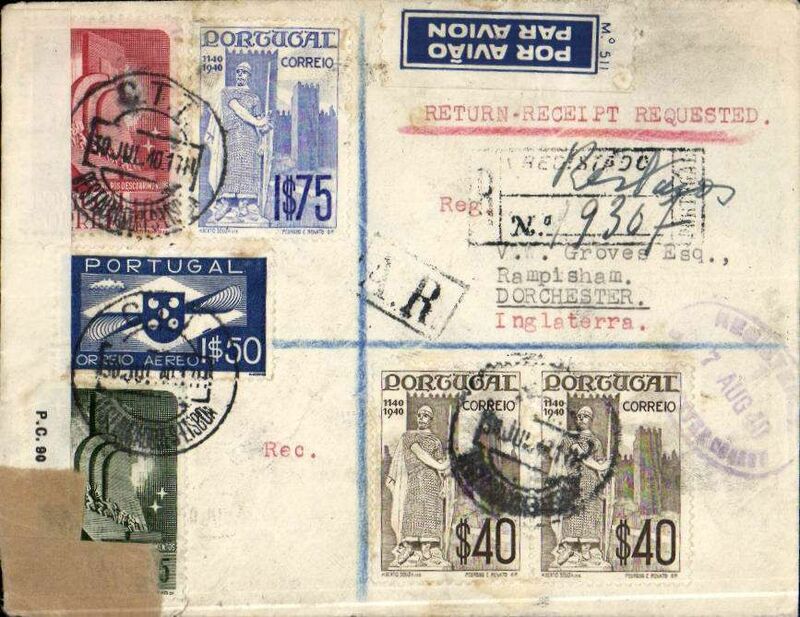 F/F FAM 18 Southern North Atlantic route, Lisbon-Horta b/s, blue cachet, attractive red/white blue 'First Flight/Transatlantic/By Air Mail' Clipper souvenir cover. 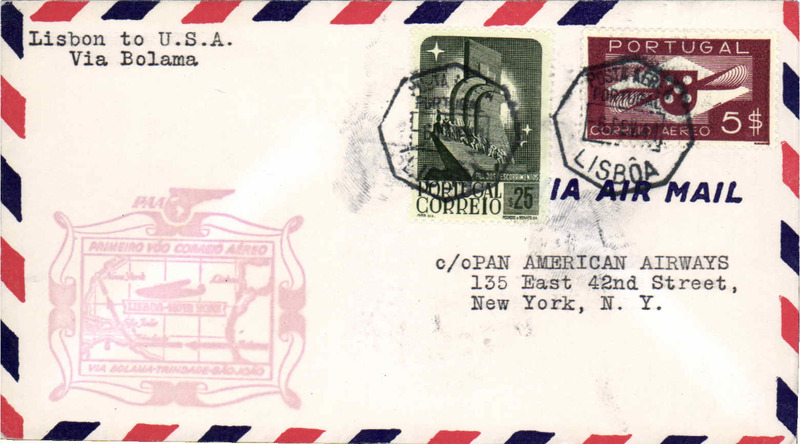 World War II, Lisbon to Heston (London), no arrival ds, return of the first experimental (proving) flight by BOAC to connect with PAA-New York-Lisbon service. 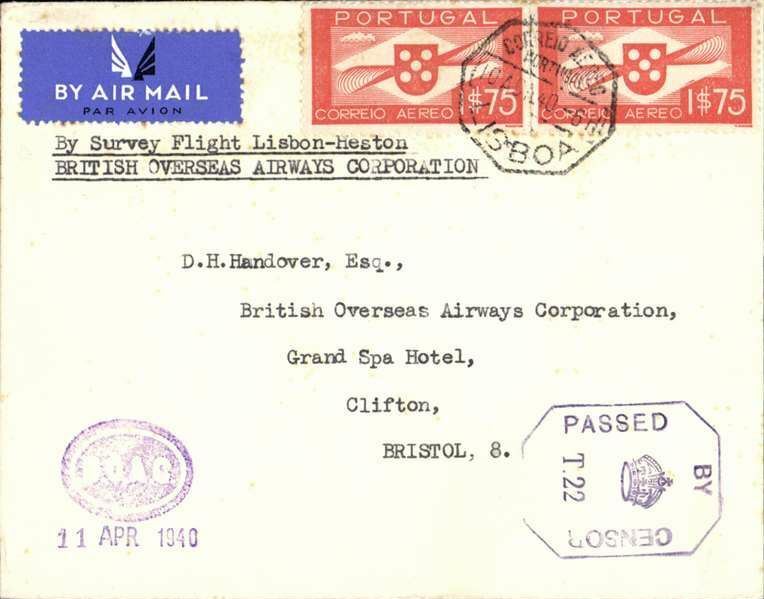 Airmail etiquette cover franked 1$75 x2, canc Lisboa octagonal ds, typed "By Survey Flight Lisbon-Heston/British Overseas Airways Corporation", violet oval 'BOAC'/11 Apr 1940 hs on front lower corner (BOAC was only formed on April 1st, 1940). A scarce item in superb condition. 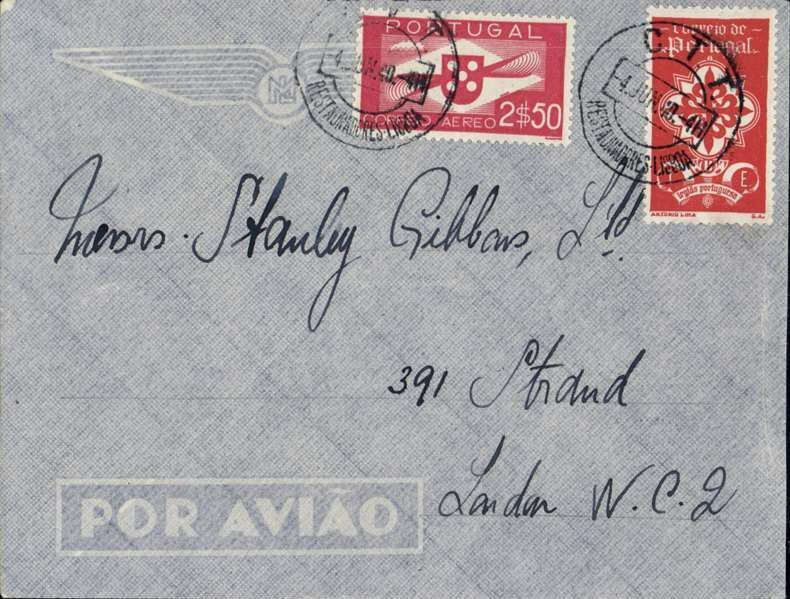 First return flight of the new regular BOAC England-Portugal Air Service which connected with the Pan Am Lisbon-New York service, Lisbon to London, bs oval Stanley Gibbons hs with ms 14th June 1940 arrival confirmation, airmail cover franked $3.50 canc Lisbon dr. cds. Scarce item in fine condition. 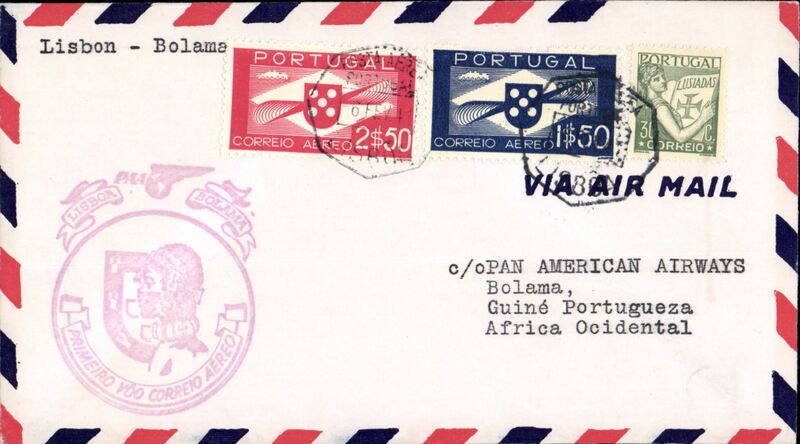 First return flight of the new regular BOAC England-Portugal Air Service which connected with the Pan Am Lisbon-New York service, Lisbon to London, Sutton Coldfield cds over GB 1/2d verso confirming arrival, franked $1.75 x2 canc Lisbon dr. cds, printed BOAC (misspelt BAOC) cover with logo lower lh corner, typed 'First return flight - Lisbon to/London - of the new England-Portugal service', sealed B&W GB PC66 #3235 censor tape.. Scarce item in fine condition. Lisbon to London, 7 Aug 40 arrival oval regn. ds on frontregistered (hs) cover franked 5.46E, canc Lisbon cds, no arrival ds, blue/white M 511 airmail etiquette, sealed GB PC90 OBE 714 censor tape. 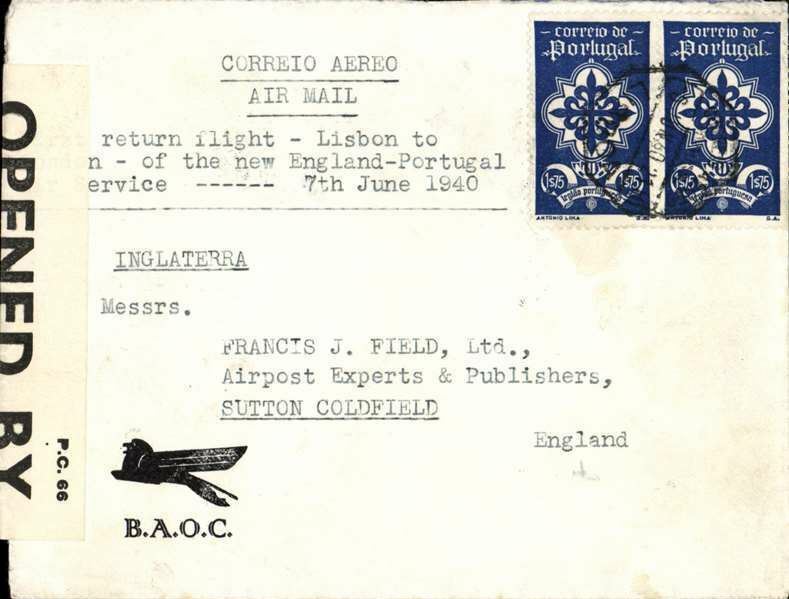 Carried on the new the new England-Portugal Air Service which opened on 7 June 1940. F/F FAM 18, alternative westbound service, Lisbon to San Juan, via Lisbon-Bolama-POS, cachet, b/s, Pan Am. 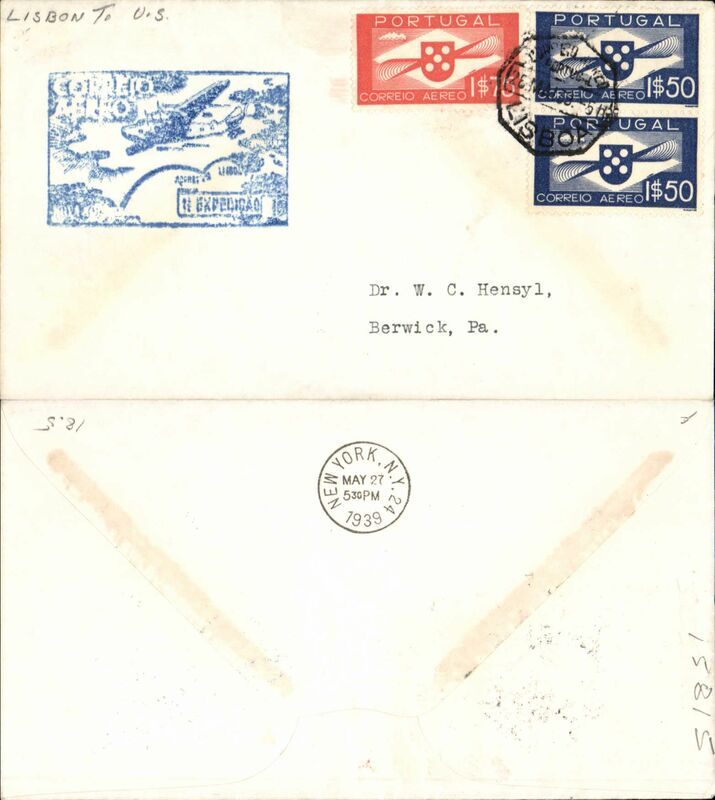 World War II censored commercial air cover to New York, no arrival ds, franked 5.25E canc Lisbon cds, sealed OBE 4584 censor tape, Pan Am FAM18 Southern North Atlantic route. Two closed top edge nicks. 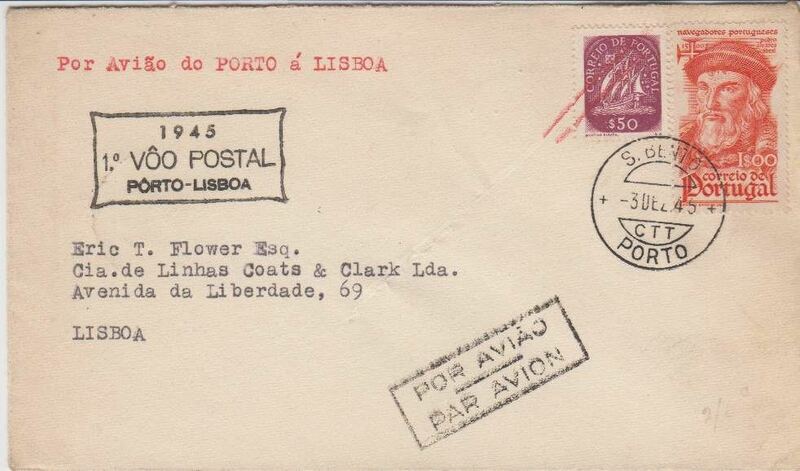 F/F Porto to Lisbon, bs 3/12, plain cover franked 1S50, black framed flight cachet. 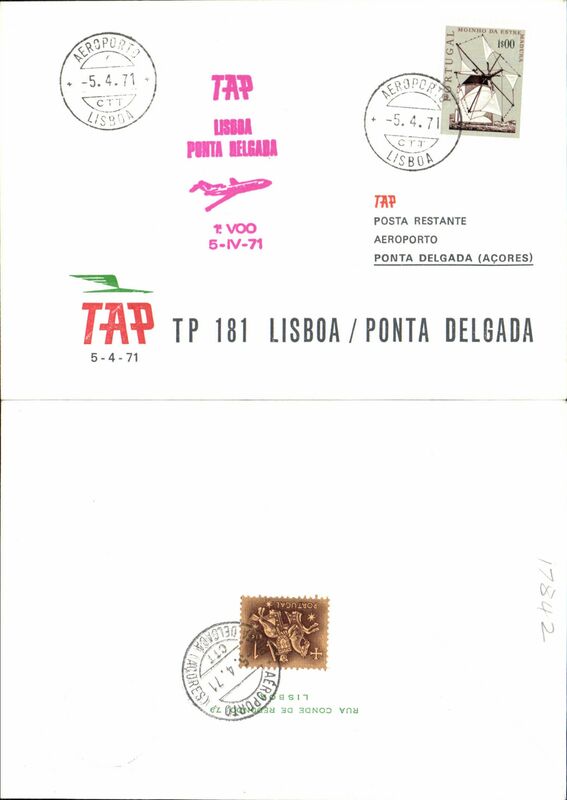 TAP F/F Lisbon to Beira, b/s, souvenir cover addrssed to Netto. TAP first Caravelle Lisbon to Paris, b/s, cachet, souvenir cover. 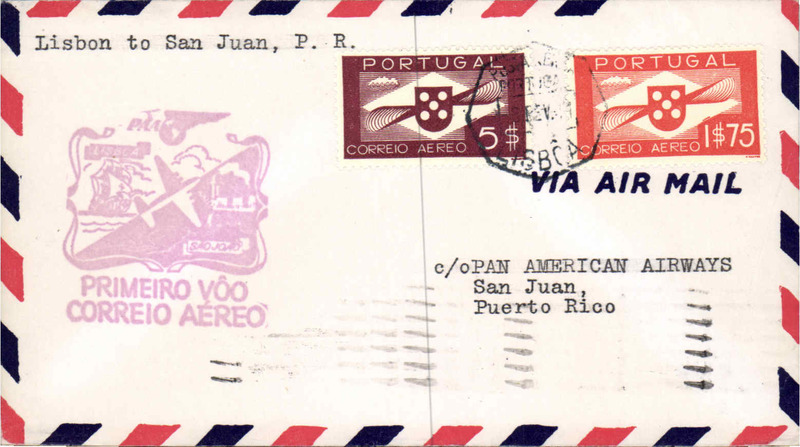 TAP F/F Porto Santo to Santa Maria, Azores b/s, cachet, souvenir cover. 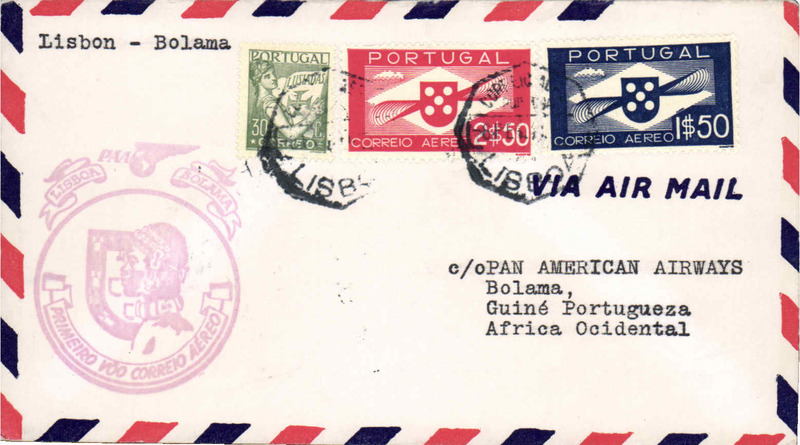 TAP F/F Lisbon to Luanda, b/s, cachet, souvenir cover. 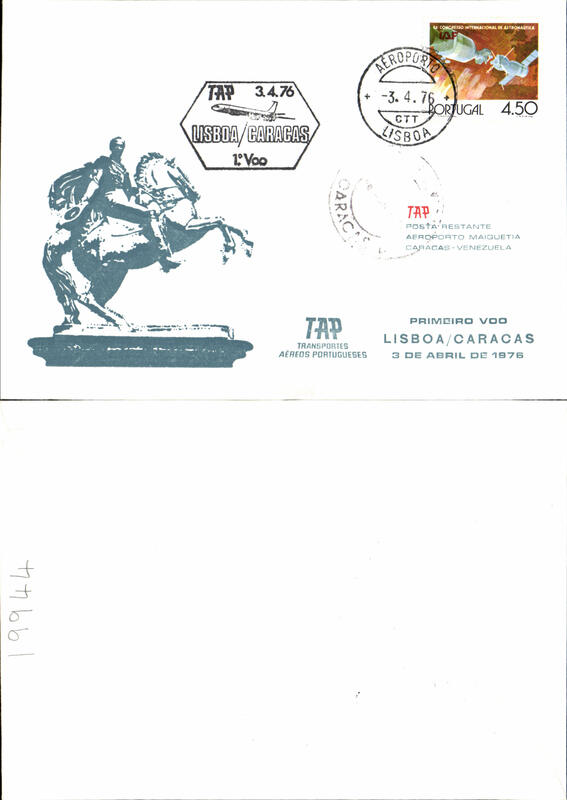 TAP F/F Faro to Lisbon, b/s, cachet, souvenir cover. 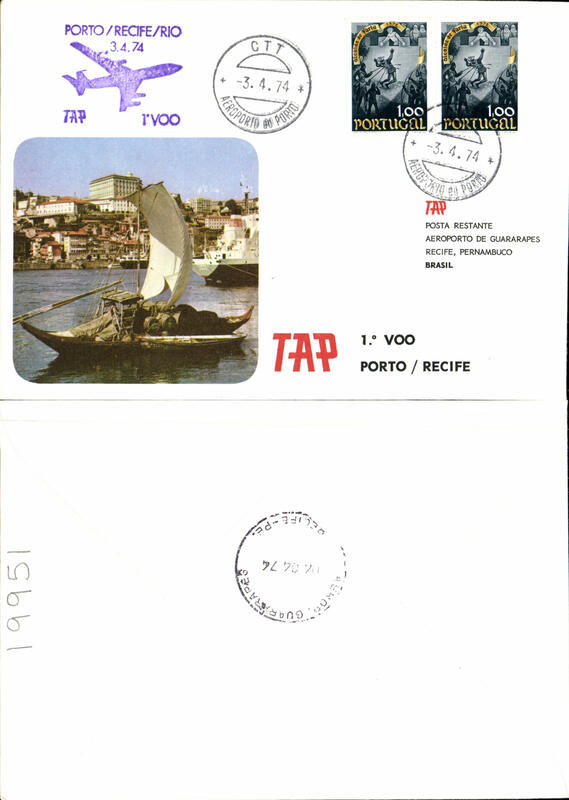 TAP F/F Lisbon to Faro, b/s, cachet, souvenir cover. 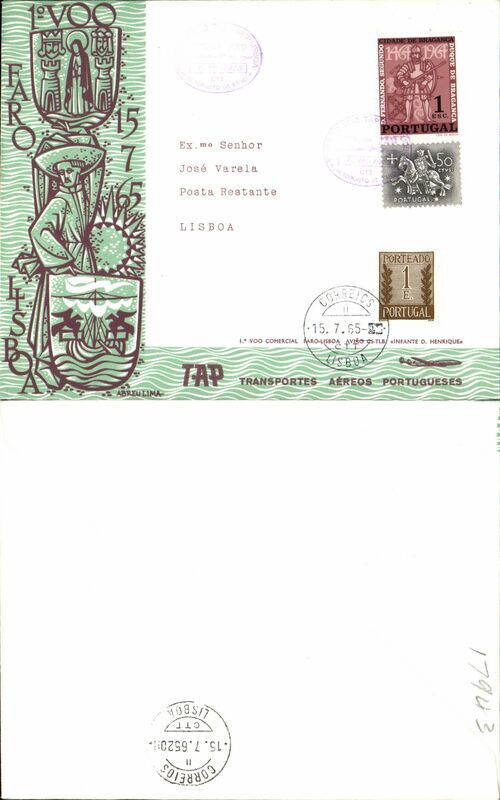 TAP F/F Lisbon to Beira, b/s, souvenir cover. 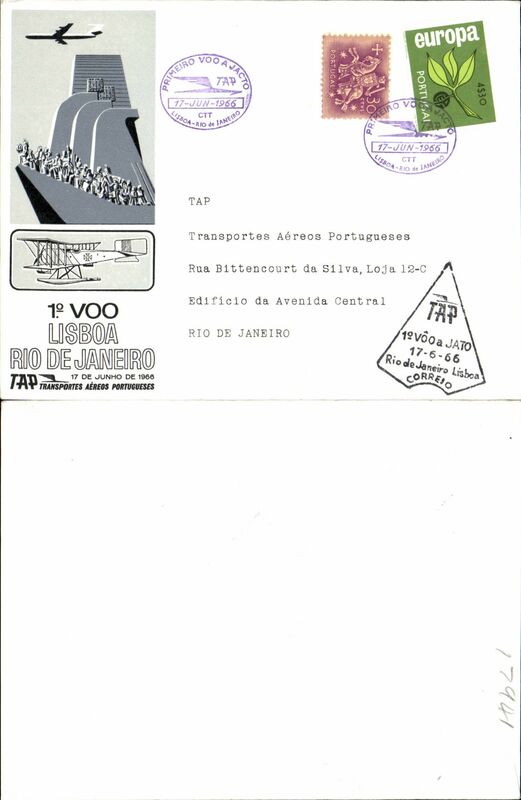 TAP F/F Lisbon to Rio de Janero, b/s, cachet, souvenir cover. 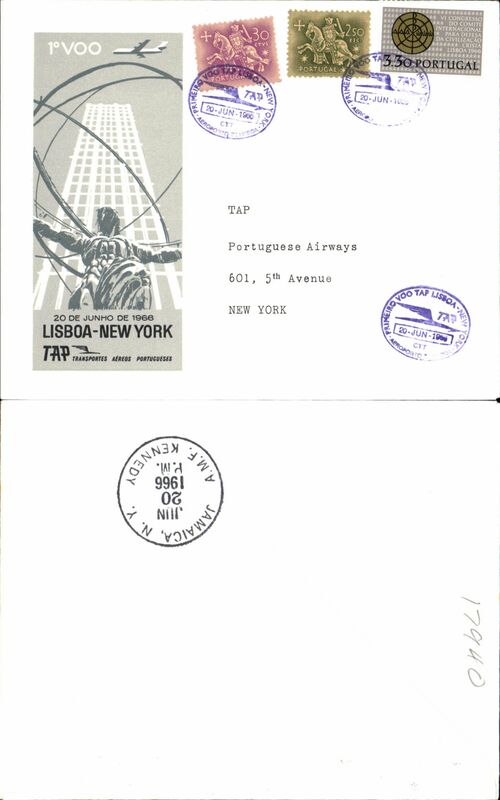 TAP F/F Lisbon to New York, b/s, cachet, souvenir cover. 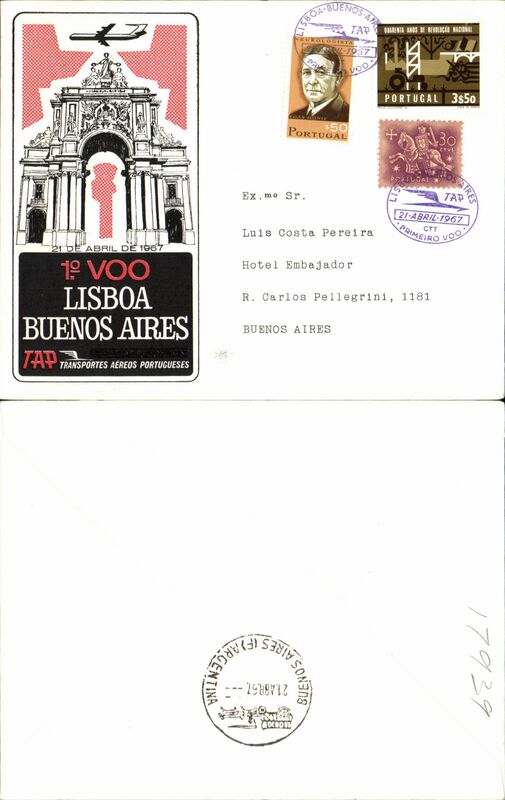 TAP F/F Lisbon to Buenos Aires, b/s, cachet, souvenir cover. 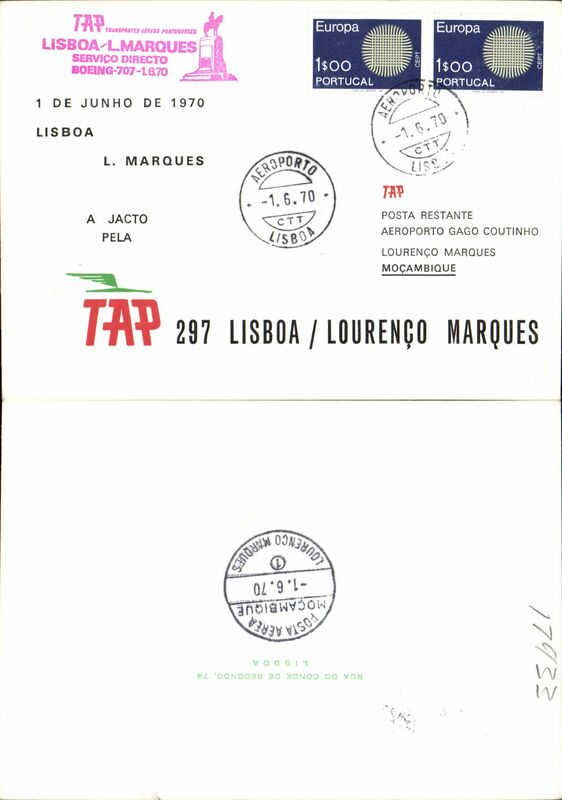 TAP first direct B707 Lisbon to Lourenco Marques, b/s, cachet, souvenir cover. 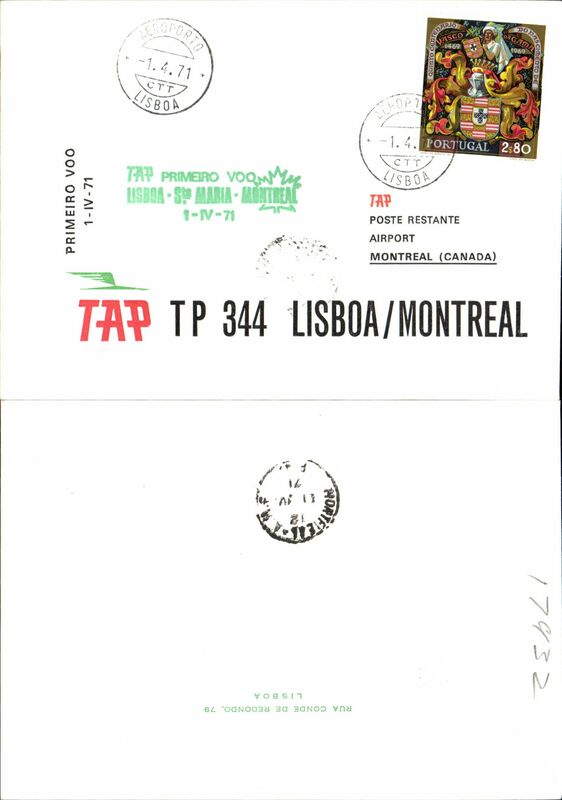 TAP F/F Lisbon to Montreal, b/s, cachet, souvenir cover. 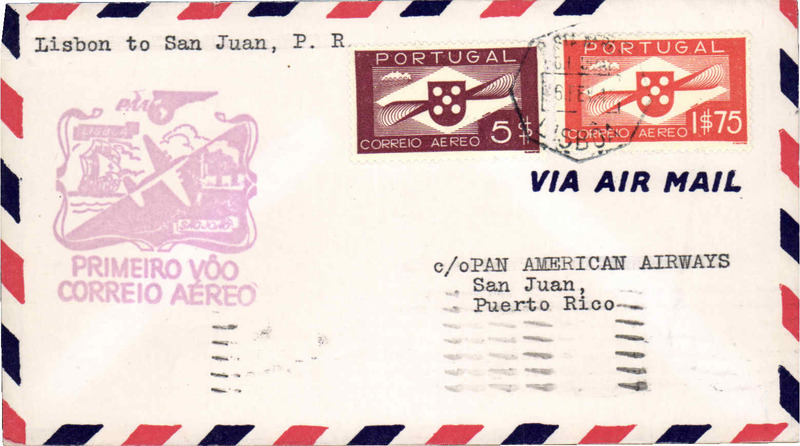 Transportes Aereos Portugueses (TAP), F/F Portugal to Azores, souvenir cover postmarked Lisbon, cachet, b/s Ponta Delgada 5/4. 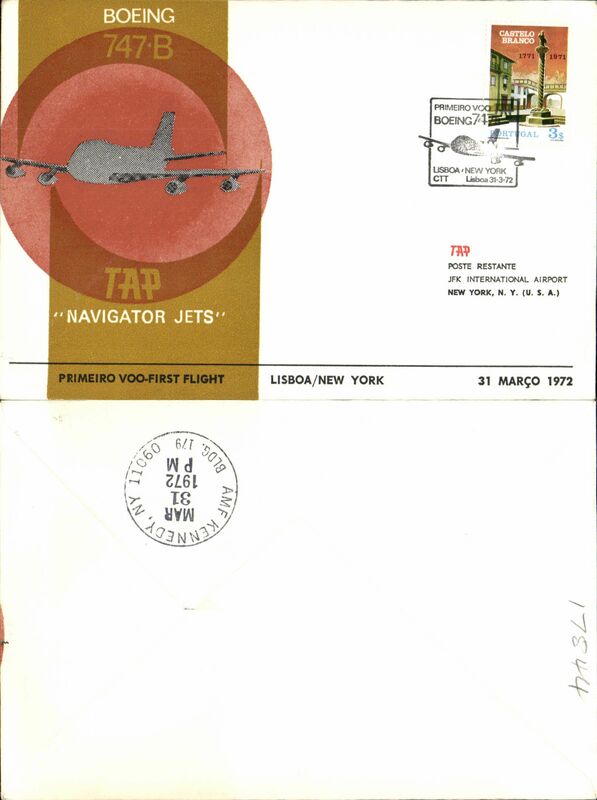 Transportes Aereos Portugueses (TAP), F/F Lisbon to New York, souvenir cover, cachet, b/s. 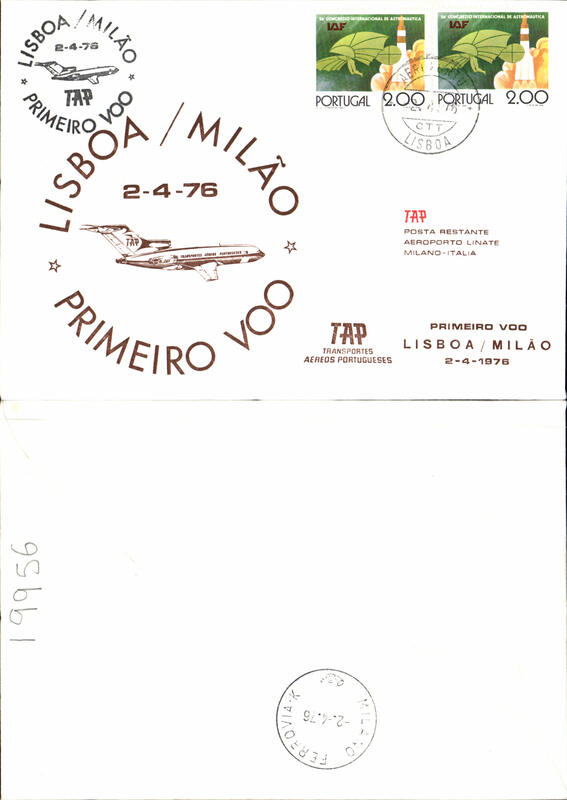 Transportes Aereos Portugueses (TAP), F/F New York to Lisbon, souvenir cover, cachet, b/s. 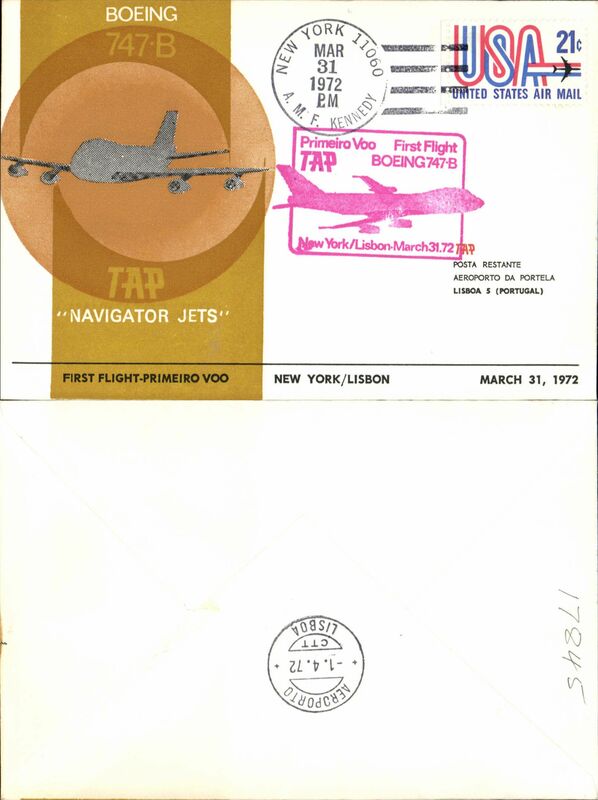 TAP first B747B Lisbon to Lourenco Marques, b/s, cachet, souvenir cover. 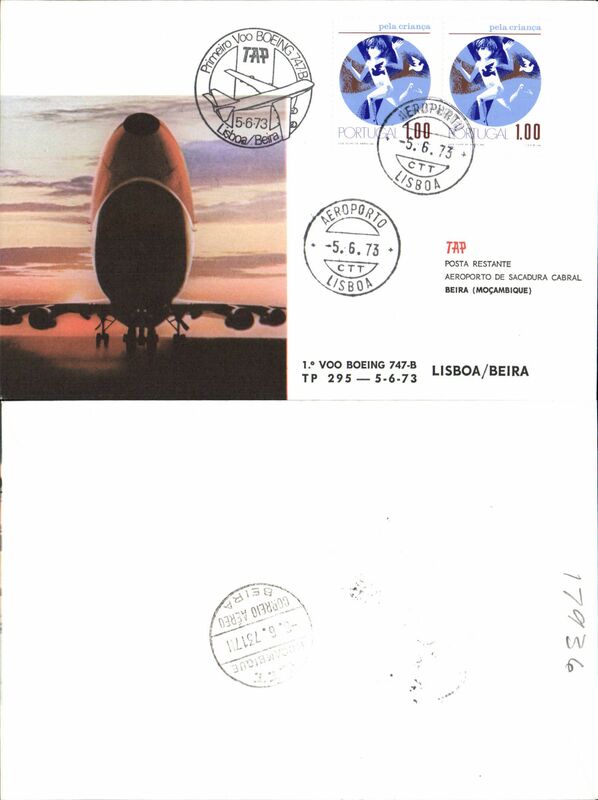 TAP first B747B Lisbon to Beira, b/s, cachet, souvenir cover. 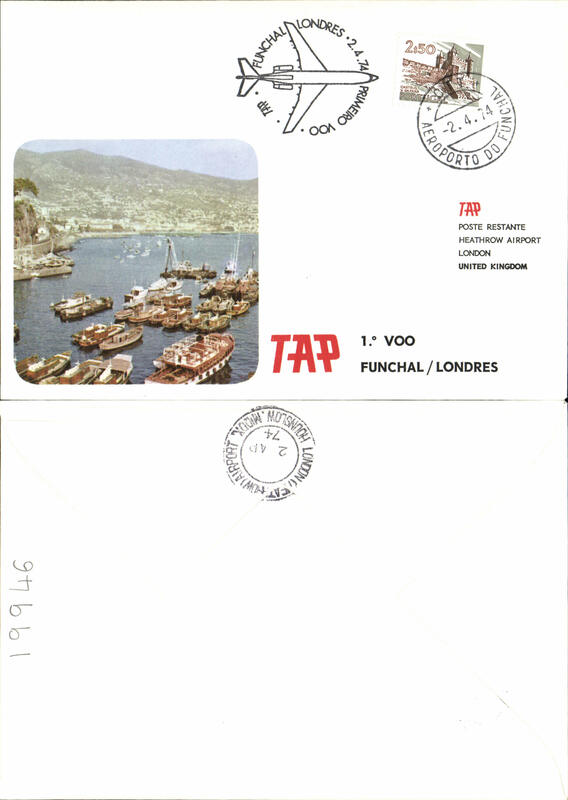 TAP, F/F Funchal (Madeira) to London, b/s, souvenir cover, cachet. 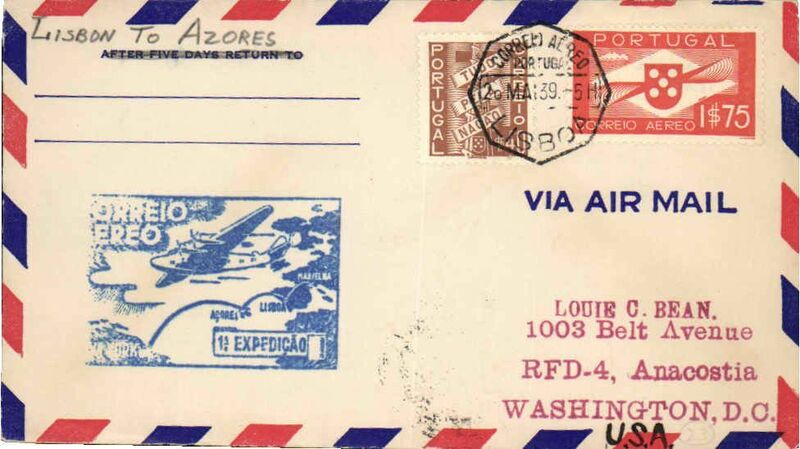 TAP, F/F Lisbon to Rio de Janeiro, b/s, souvenir cover, cachet. 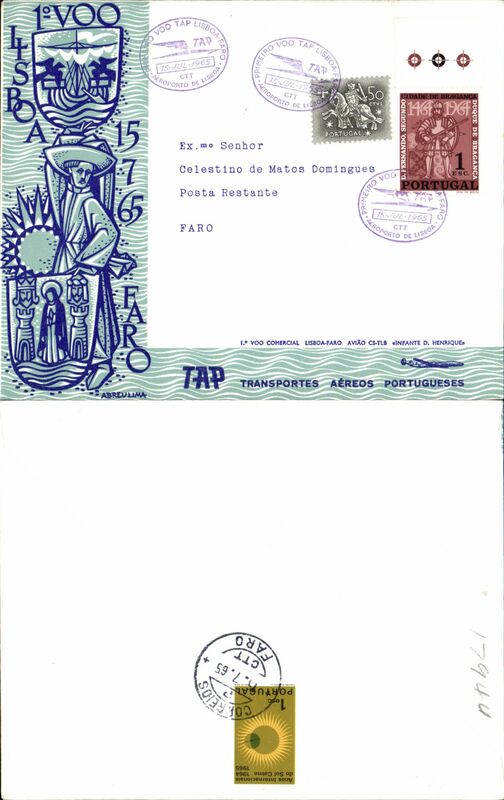 TAP, F/F Porto to Recife, b/s, souvenir cover, cachet. 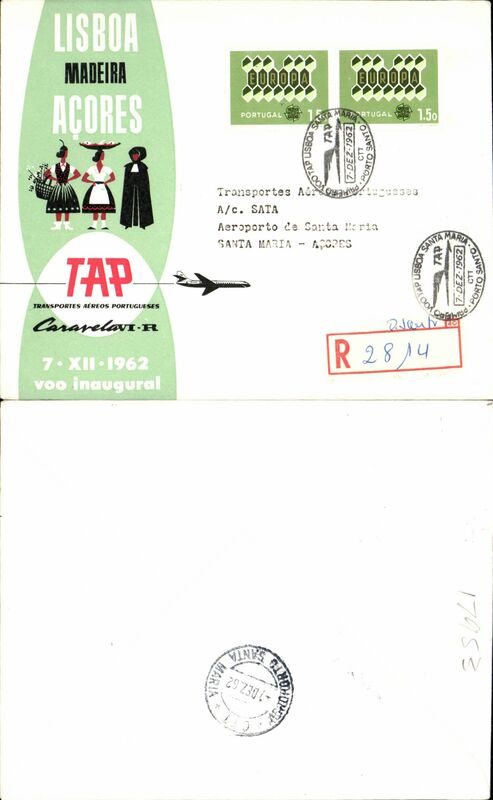 TAP, B 747B F/F Lisbon to Rio de Janeiro, b/s, souvenir cover, cachet. 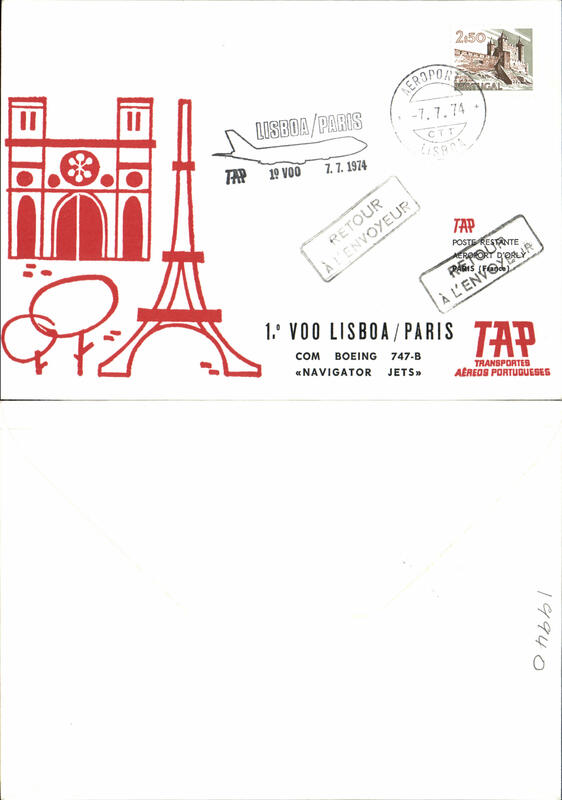 TAP, B 747B F/F Lisbon to Paris, souvenir cover, cachet. 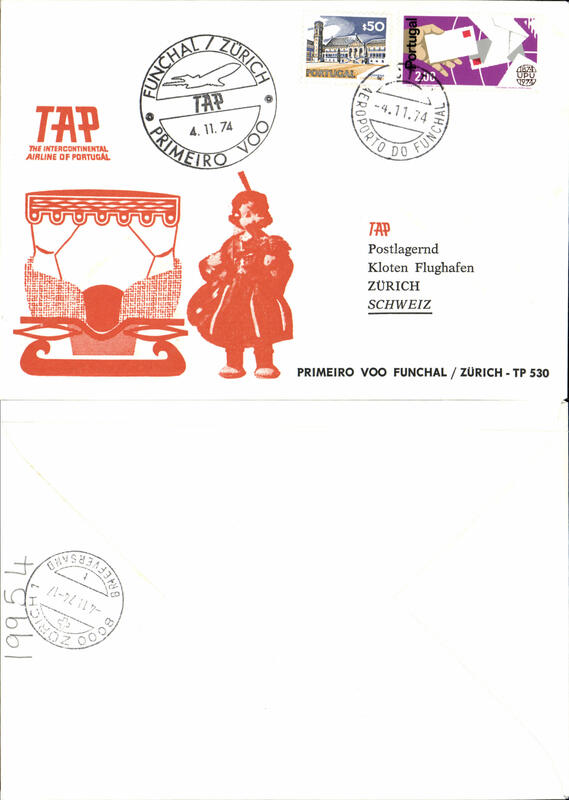 TAP, F/F Funchal (Madeira) to Zurich, b/s, souvenir cover, cachet. 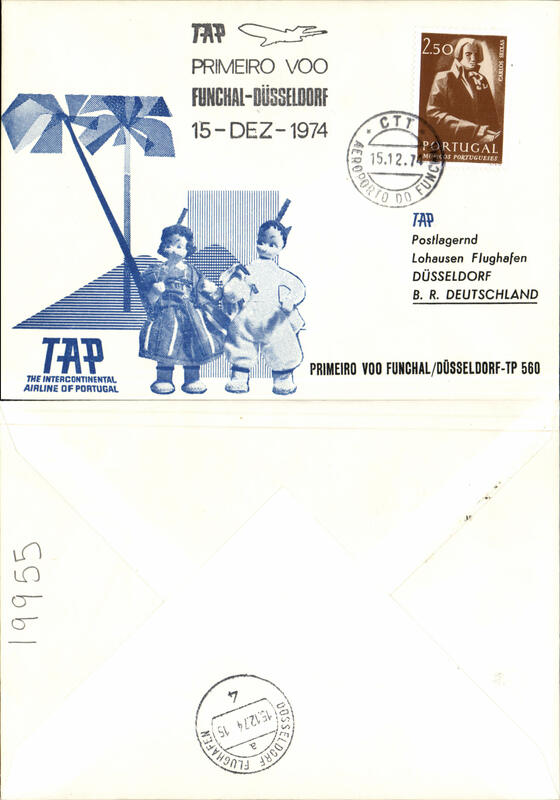 TAP, F/F Funchal (Madeira) to Dusseldorf, b/s, souvenir cover, cachet. 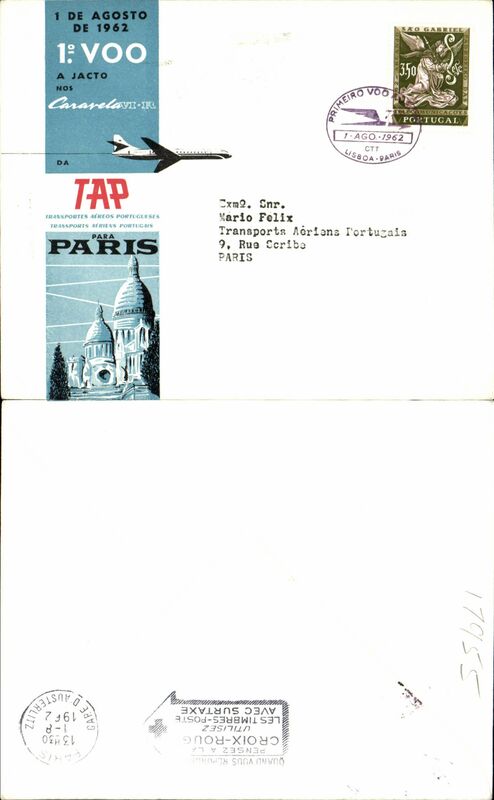 TAP, F/F Lisbon to Milan, b/s, souvenir cover, cachet. 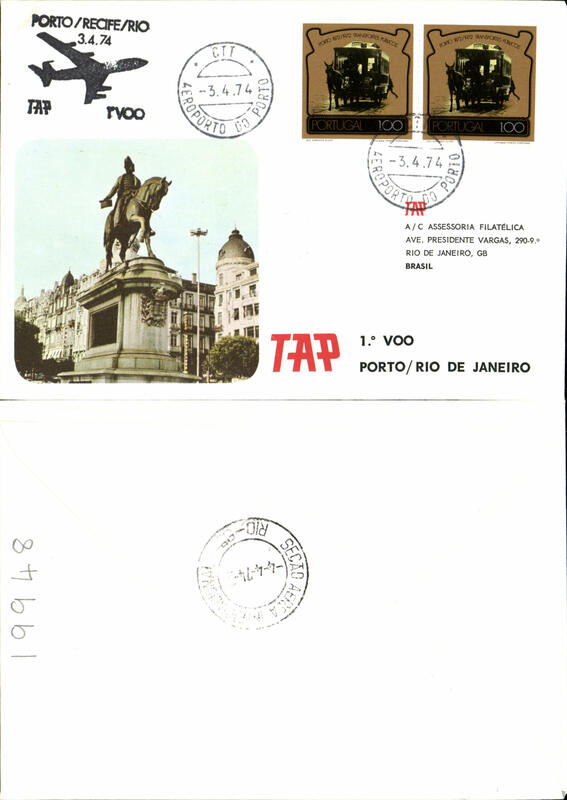 TAP, F/F Lisbon to Caracas, arrival ds on front, souvenir cover, cachet. 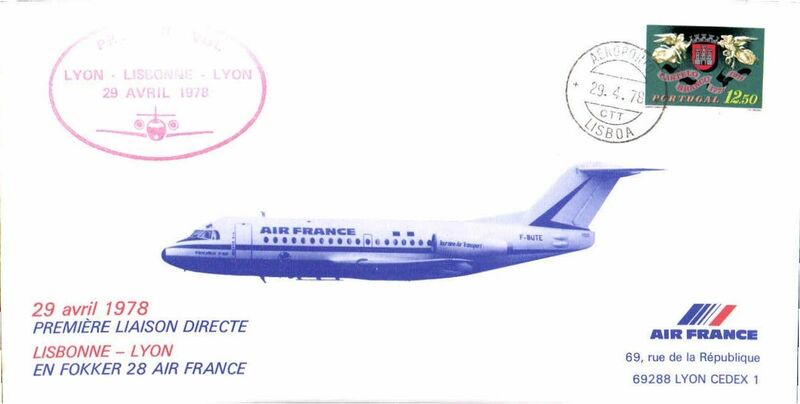 First direct flight Lisbon to Lyon, cachet, b/s, long souvenir cover, Air France. 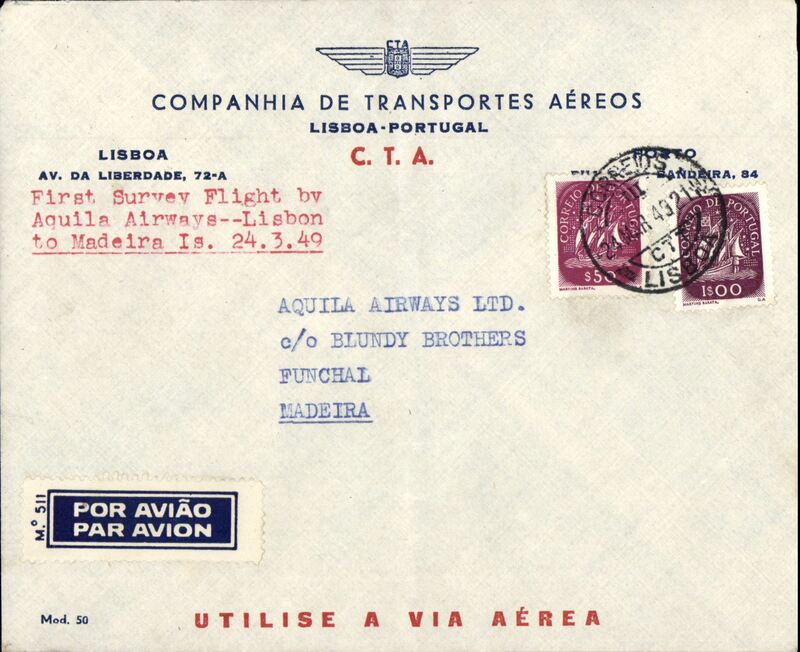 75th anniversary Beires & Pais flight from Portugal to Macao, FD franked FDI 140$ x2 miniature sheet.